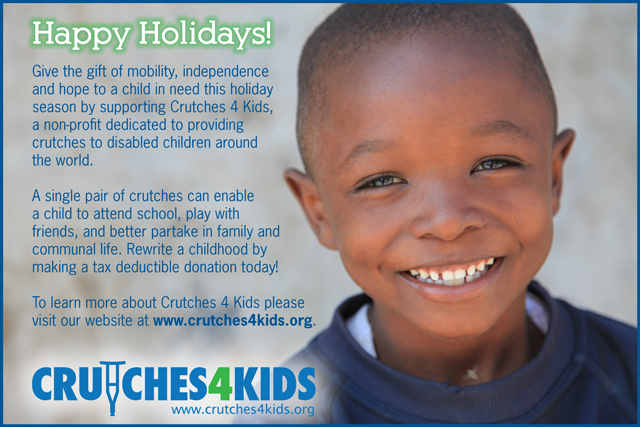 Give the gift of mobility this Holiday Season! Transform a child's life this holiday season by enabling them to walk! While crutches are a rare and precious commodity in poverty stricken regions of the world, hundreds of thousands are languishing in closets, garages and storage spaces in our neighborhoods. Crutches 4 Kids is committed to recycling these unused crutches. We work in partnership with a network of concerned citizens and well-established humanitarian organizations to collect and distribute crutches to those in need, improving the lives of thousands of children! Every donation makes a difference! Donate today! Thanks in advance for your generous support.